These specially designed 18”, 24”, and 30” diameter CEME-TUBE® models will revolutionize the installation of light pole footings. This CEME-TUBE® is manufactured in reflective Caution Yellow, Concrete Gray, or Architectural Bronze colors. All of which contain strong UV inhibitors to protect the CEME-TUBE® from fading. To create aesthetic appeal and minimize installation labor, the top perimeter has an integral radius which will transition the sides of the CEME-TUBE® to the top surface smoothly. This top radius also eliminates chamfering. A 17” diameter Hole is provided on the top to facilitate pouring, finishing and lightpole installation. (15” hole on the 18” model) This CEME-TUBE® is intended to remain on which will save time and labor on stripping, painting, chamfering and concrete finishing. 18” Light Pole model in Safety Yellow. 24” Light Pole model in Safety Yellow. 24” Light Pole model in Architectural Bronze. 24” Light Pole model in Concrete Gray with a Fleck. 30” Light Pole model in Safety Yellow. Available in 18″, 24″, and 30″ diameters, all models are 4′ in length. An integral collar on all models allows the CEME-TUBE® to be easily stacked onto a standard black CEME-TUBE®. The standard black CEME-TUBE® must be used below grade, and below the Light Pole CEME-TUBE® to provide deeper footings. The reflective yellow, bronze, or gray color is molded throughout, not just applied. The reflective yellow, bronze, or gray color is highly visible, especially at night. Concrete or asphalt will not adhere to the sides of the Light Pole CEME-TUBE® which eliminates any friction frost heaving. The Light Pole CEME-TUBE® will provide a finished product upon installation and will be very aesthetically appealing to the customer. The outside of the CEME-TUBE® is smooth and seamless. 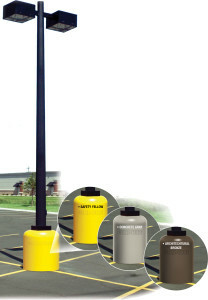 The walls of the Light Pole CEME-TUBE® are extremely heavy to handle the punishments of parking lot bumps. Molded from partially recycled HDPE plastic that remains flexible to -103 Deg. F.
The CEME-TUBE® will not chip or crack when cold. Significantly lower installation costs compared to cardboard. • No more rotating lines! • And, the Light Pole CEME-TUBE® will never need painting! • The Light Pole CEME-TUBE® is finished upon installation, and is very aesthetically pleasing to the customer.